Happy Friday, everyone. 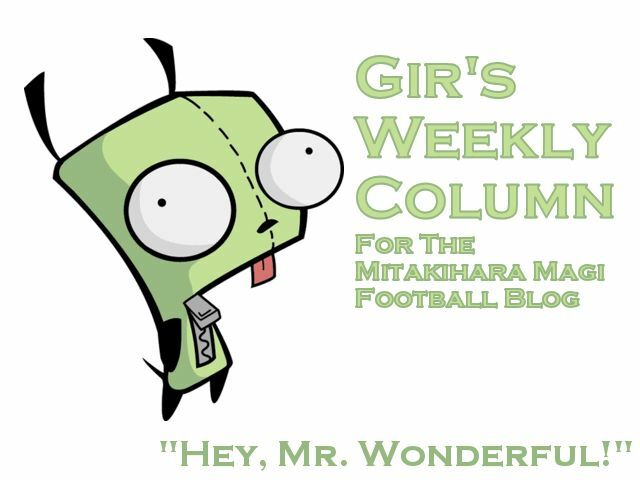 I am Gir Todafunk, ace cornerback for Tatsuya Kaname's Mitakihara Magi football team, with another weekly column the Daily Magi Newspaper and TDM's Magi Football Blog. A quiet day last weekend in Colorado Springs, with just four tackles and a pick. Nyaruko, though, was playing out of his skins: 14 tackles! My God! That's a lot of tackles right there. And the victory wasn't too impressive, more like a slap on the wrists. Still, a win is a win is a win, and we're looking for another win this week in Reno. We are staying at the Atlantis Casino Resort & Spa. Why? It's home to the best-rated buffet in the city. And speaking of buffets, I would like to disclose my top 10 buffets to eat at in Reno. Now, I must offer this disclaimer: Reno isn't home to the best buffets in Nevada. That honor belongs to Las Vegas. However, the objective here is to be a gormandizer and enjoy food like you enjoy life. That, to me, is the epitome of a buffet. Here's the list, courtesy of Gir Todafunk. This is where the team had its welcome dinner. Perfectly cooked prime rib...check. Crab legs with claws on dipped in melted butter...check. High-quality Mongolian barbecue which is actually a Taiwanese invention...check. If there was ever a place for a hungry group of gridiron kings to recharge in Reno, this would be the place. Another place with solid prime rib. The mint chocolate chip and mango gelato is a top draw, as well as the Italian dishes, polenta and calamari steaks. Great pizza, but it's the bakery items that places this buffet on Gir's list. The cheesecakes are top notch. Oh yes, and the shrimp cocktail is not too bad. Located in an industrial area, this is popular with the local lunch crowd and the Japanese entrees are notable. I have seen a number of anime fans hang out here, strangely. Excellent prime rib and crab legs. It seems to me that buffets in this state are defined by the prime rib and crab legs here. In terms of desserts, you gotta go with the crepes. Omelettes are not bad, too. Believe it or not, this Indian restaurant does have a lunch buffet and it's not too bad. Aside from the buffet, the best Indian fare can be found here. This is a no-nonsense buffet, old school "what you see is what you get" type. Despite not having a drink fountain, the entrees that Sands Regency offer are decent and are a good value. Located in nearby Verdi, this is where all the lobster is at. The lines are long, and this is really popular with the high rollers. Yet another place with solid prime rib. This is a trend. Roasted potatoes, cheese blintzes, salmon and scampi. Gotta go with the scampi. This was actually the team's second choice, but it lost out to Toucan Charlie's. Oh yes, this place also delivers with the prime rib. Also tops are the roast beef, pesto mashed potatoes and warm bread pudding. It would be interesting to savor all these different buffets, but we're better than that. That is the list of my favorite buffets in Reno. Hmmm, I wonder what to write in my next column. I suppose you will have to tune in next week to find out. I am Gir, Mr. Wonderful, signing off. You are not alone.